Rapa Nui (Easter Island), "The Navel of the World"
Easter Island, Rapa Nui in native language, or Isla de Pascua in Spanish, is a Chilean possession of 163.6 Km2., the easternmost island of Polynesia in the continent of Oceania. It is located 2,191 miles away from the nearest point in South America, its population reaches a little over 5,000, mainly concentrated in Hanga Roa, the capital. Administratively, the island depends on Valparaiso, Fifth Region of the country. Its geographical location, so far away from other inhabited islands, makes it one of the most isolated places on earth, not for nothing its ancient inhabitants called it Tepito Ote Henua (The Navel of the World). The volcanic origin of the island, made it an ideal quarry so that the primitive inhabitants built the almost 900 stone statues world-wide known as Moai, and the altars called Ahu. There are three extinct volcanoes that are the main ones: the largest is called Maunga Terevaka of 525 meters high, the Paukatike of 370 mts. on the Peninsula of Poike and Rano Kau of 324 meters. Currently, Isla de Pascua is one of the main tourist attractions in Chile for its beauty, geography and enigmatic "Rapa Nui" culture. The island has a pleasant rainy subtropical climate, humid due its abundant rainfall, of moderate temperatures without major oscillations. CONAF, the National Forest Corporation in conjunction with other private agencies has lately conducted reforestation programs to mitigate the progression of the erosion that has affected some parts of the island. There are a number of Cruise Tours and Charter Flights to Easter Island, but the most usual way travelers come here is through regular flights of the Chilean company LATAM Airlines from Santiago de Chile. Although so far the island does not have a commercial port protected from the climatic conditions, by far tourism in Easter Island is the most important activity, reason why the rest of the infrastructure to provide tourist services is of quality, from tourim agencies and restaurants even to Five- Star Hotels. The official languages are Spanish and Rapanui, the currency is the Chilean Peso. Here I give you a list of tourist places in Easter Island. Created in 1966, run by CONAF (National Forest Corporation). Declared a World Heritage Site by UNESCO in 1995, currently this park has an area of 7,150 Hectares, which means 43.5% of the island. The activities mainly include guided cultural tours, horseback riding, trekking, scuba diving, sea kayaking and surfing, recreational fishing, wildlife observation, photography. The park has food and crafts sale, picnic areas, trails, lookout, horse rental. Like any other National Park there are some basic rules to respect and worth take into account, otherwise the fines can be quite expensive: Camping is not allowed, do not touch or scribble on any archaeological remain, do not circulate out of the established paths, no standing on Moai platforms (Ahu) Tickets can be purchased at Mataveri Airport upon flights arrival or at CONAF in Orongo and Rano Raraku Stations. If it's about breathtaking views this is number one on the island and one of the main in the world. It is located in the extreme south west of Easter Island, along with the Maunga Terevaka and Poike (Paukatike) are the 3 main volcanoes (of over 70) whose eruptions millions of years ago gave rise to the island and its triangular shape. The inner depression has a diameter of 1.5 km. long with a small lake inside that is one of the three freshwater sources of the island. Near the top of the volcano, on its western end, is located the village of Orongo, reconstructed remains of a 53 houses village made of flagstone that had great importance for the cult of the Make-Make god, creator of Humanity and the Tangata Manu (Bird Man) competition. The village was inhabited by priests and only during the ceremonial season. The rite consisted of the best representative of every tribe competed to obtain the first egg of the migratory bird called Manutara that nested on the islet of Motu Nui. Each participant had to swim to the islet, find an egg, swim back and climb the cliffs with the egg intact and once at Orongo, give it to the King. The winner of the race and his family enjoyed a great power, which lasted a whole year. The last competition of the Tangata Manu was held in 1866. 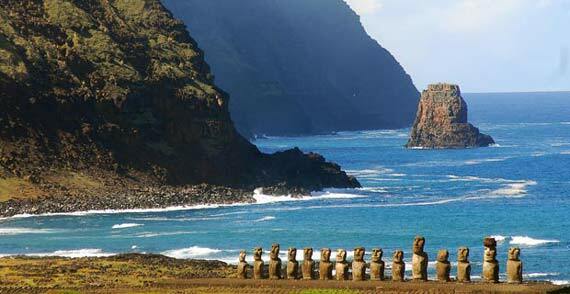 One of the must-see places in Easter Island. This is not only a volcano crater with a lagoon inside, but it has an immense geological and historical value since it was the quarry where the moai were carved, being the place on the island where the largest number of statues is concentrated, with hundreds of moai at different stages of manufacturing. 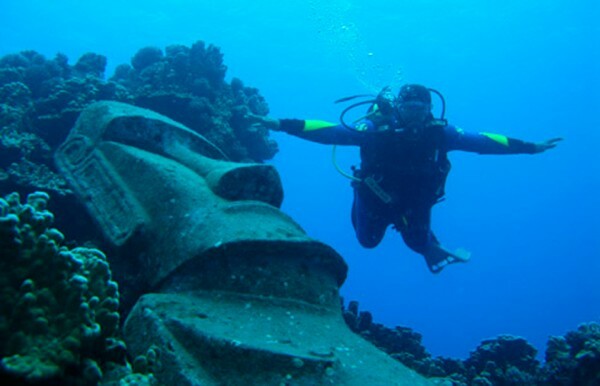 It is believed that the statues that had been built for about 1,000 years, may have been destroyed by the own islanders having lost faith in their power, or product of tribal wars for the exploitation of resources, another theory says that a tsunami may have devastated the island since some of the moai have been found on the seabed. Of the old Rapa Nui culture little or nothing is known with certainty, because in the second half of the nineteenth century Peruvian traffickers practically decimated the race. Though not of great extent, it is the main beach in Easter Island, certainly one of the most beautiful places to relax, located 18 Km. from Hanga Roa, following the road that crosses the island. Unlike the coast of central Chile, the waters are much warmer, marine life can be seen through the crystal clear waters, the sand is white, with palm trees and moai near, besides it is a beach visited by few people, which makes it very quiet. There are places to eat and buy crafts. From the beach of Anakena can be observed the row of seven moai known as Nau Nau, whose altar (Ahu), is still in good state of preservation. Beacuse of its clear, unpolluted waters, with temperatures averaging 22 °C in Summer and deep-water visibility up to 50 meters, Easter Island is an ideal place for the practice of diving, snorkeling, surfing and other sea-related recreational activities. Beginners in water sports can take a course which can also provide with appropriate equipment and the constant accompaniment of a specialized instructor. To dive in shallow waters, no license is required. The island has many diving sites for all divers. The spots range from 10 meters deep, for beginners, up to 40 meters for those with deep diving specialty. Due to its volcanic origin, the island has an unique underwater topography, composed of lava caves and arches, cliffs, etc., along with corals and rich marine life. Among the most renowned diving spots in Easter Island are the fake "Submerged Moai", which was placed there in modern times; the 3 small islets called "Motus" in Rapa Nui language, located south of the island; "The Cathedral", caves originated by the volcanic formation of the island; "Vai to Heva", in Hanga Roa Bay, an ideal place for submarine "baptisms", here is a reef with a variety of fish and Sea Turtles that accompany novice divers on their travels; "The Cliff", diving spot located about 25 minutes North by boat, where there is a cliff that begins on a platform ranging from 12 meters to 33 meters at its deepest part. Te Pito O The Henua in Rapa Nui language, located 26 km. North of Hanga Roa, the capital of the island. It is a large round stone representing the navel of the world, the same name with which the natives call their island. The main stone is surrounded by another four smaller indicating the four cardinal directions. It is believed that the origin of Te Pito O Te Henua Stone is from a meteorite and that was brought by King Hotu Matua from the former island of Hiva. The tradition is to put the hands on it to be charged with positive energy and is even said to increase fertility. Because of its high iron content, it heats up more than an ordinary stone and causes compasses to behave strangely. 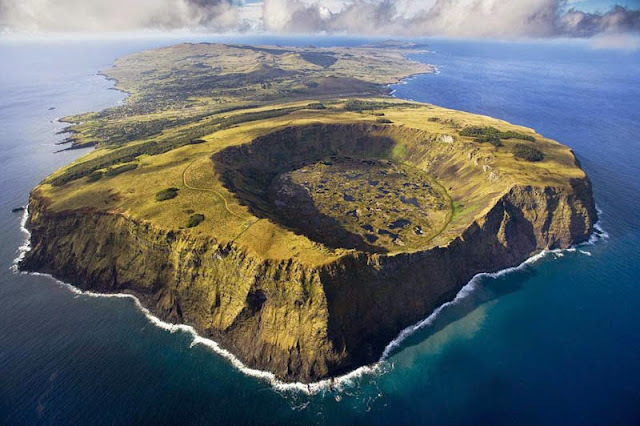 It is an extinct volcano located in the northern vertex of Easter Island, with its 511 mts. high is the highest point, to get to the top the stretch must be made on foot or horseback. Although in terms of landscape this is not the most attractive place, once there the view is stunning as it offers a panoramic of almost the entire island; you should bring at least a bottle of water because the climb is tiring. It is a recommendable to watch the weather forecast because in case of rain or overcast day, it is better not to make the effort. It is the largest Ahu (Moai Altar), located on the southeast coast, close to the Rano Raraku Volcano, consisting of 15 statues of imposing size, perfectly aligned and with different styles and features because they allegedly represented the forefathers. It constitutes one of the most representative views of the island. Despite the large tonnage of the pieces, this Ahu was devastated by the 1960 earthquake of Valdivia, 9.5 Richter scale and the tsunami that hit the coast of the South Pacific. However, at the beginning of the decade of the 90's, there was a restoration work that was carried out with great precision and with the support of the Government of Japan. It is advisable to perform the visit with a guide to learn in detail the history of the place and understand the ancient rituals, mythological stories and great tribal battles that took place here. Very near, at the end of the esplanade, is located Papa Tataku Poki, where you can see petroglyphs with typical figures such as the Tangata Manu (Bird Man), Ika (Fish) and Honu (Turtle). Father Sebastian Englert Anthropological Museum of Easter Island, founded in 1973 and located in Hanga Roa, the island's capital, whose aim is to collect, preserve and research the patrimonial heritage of Easter Island and its original ethnic group, the Rapa Nui people, owner of an enigmatic culture. It is named after the priest Sebastian Englert, a German Capuchin who came to the island in 1935 and dedicated 34 years of his life to the study and dissemination of the language, traditions and archaeological heritage of the Rapa Nui ethnic group. With very detailed information panels showing the history of Easter Island from its geological formation. This museum also houses the William Mulloy Library, so named in honor of a prestigious American archeologist, specialized in issues of Easter Island and Polynesia. The Chilean Government has created two new Marine Protected Areas, one of them very extensive in Easter Island, amidst the South Pacific, announced President Michelle Bachelet, opening the 2015 "Our Ocean" Conference in the Region of Valparaiso. The goal of the second version of this meeting is to reach solutions to deal with illegal fishing, marine plastic pollution, ocean acidification and its relationship with climate change. The waters around this part of the Ocean are considered a real oasis of nutrients in an area of the Pacific where the water is very poor in food. The new protected area around Easter Island, added to the existing in Motu Hiva Motiro -Iorana-, will complete a total of 720,000 square kilometers. The creation of the new marine parks also includes the islands of San Ambrosio and San Felix, closer to the South American Continent, totaling one million square kilometers, one of the largest areas in the world, a 25% larger than the total area of the country in its South American portion.